The Wolf 92.1 live broadcasting from the USA. 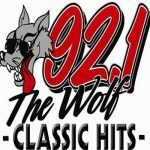 The Wolf 92.1 plays the ideal blend of Classic Hits from the 60’s, 70’s and 80’s! The Wolf 92.1 are additionally your home for High School Sports! It’s all here, on Classic Hits 92.1 The Wolf!